After thirty-one days of argument, a five-judge bench of the Supreme Court has reserved judgment in amongst the most significant constitutional cases before the Court in recent years. Since the Supreme Court’s decision in the Second Judges Case in 1993, appointments to the Court have been made through what has come to be known as the ‘collegium’ system – in which the three senior most judges of the Court play a decisive role in the appointments process. The collegium system suffered increasing criticism, and Parliament attempted to replace it with an appointments process led by a ‘National Judicial Appointments Commission’ (NJAC) through a constitutional amendment and a statute that gives effect to the amendment. The amendment provides that the NJAC will consist of six people – the Chief Justice of India, the two senior most judges of the Supreme Court, the Law Minister, and two ‘eminent persons’. These eminent persons are to be nominated for three-year terms by a committee consisting of the Chief Justice, the Prime Minister, and the Leader of the Opposition in the Lok Sabha and are not eligible for renomination. The Supreme Court has been called upon to decide to constitutionality of the amendment and the statute. This post will not consider the constitutionality or the merits of the collegium system and the NJAC. Although that is a most significant matter, it has been considered elsewhere (see, for example, here and here on this blog). It will explore a different, less studied, aspect of the case – the remedies available to the Supreme Court. As with the NJAC case, on most occasions on which law is challenged on the basis that it is unconstitutional, the challenge is conceived in terms of a binary – whether to strike down or not to strike down the law. The matrix of remedies available to the court is far more complex than this. In fact, although I have not come across any empirical data on this issue in India (see evidence from the UK here), the most common response to a finding of unconstitutionality is not to strike down the unconstitutional law, but to interpret it in a way that is consistent with constitutional requirements. Therefore, it is highly problematic to take the premise that: (i) the court finds the constitutional amendment unconstitutional, to mean that (ii) the court will strike down the amendment. Instead, the Supreme Court has several intermediate options falling short of the strike down power before it. In this post, I consider three such options – although this should not be taken to mean that these options are mutually exclusive, or, for that matter, collectively exhaustive. These interpretive possibilities can be divided based on whether they address the composition of the NJAC or the functioning of the NJAC, and it is in this sequence that they will be considered. Amongst the arguments that the petitioners have made is that the constitutional amendment makes no attempt to define who the two eminent persons on the NJAC will be. This, it is argued, can give rise to two sets of problems. The first is a ‘malice’ based argument – that the executive could seek to nominate people with favorable political leanings. The second is more of a ‘recklessness’ based argument – that the executive could seek to nominate people who clearly lack the credentials to judge the performance of candidates. The Supreme Court could seek to eschew these concerns by specifying a set of criteria – or qualifications – that eminent persons would need to hold. Conversely, the Court could prescribe a set of disqualifications – for instance, that those who are charged with serious criminal offences will not be considered ‘eminent’. The constitutional amendment provides that the eminent persons on NJAC are to be appointed by a Committee consisting of the Chief Justice, the Prime Minister, and the Leader of the Opposition in the Lok Sabha. The argument here is that the politicians could combine to nominate a person who, in the opinion of the Chief Justice, lacks the credentials to be part of the NJAC. One way in which the Supreme Court may seek to avoid this situation is by interpreting the provisions to the effect that the Chief Justice has a veto power in the appointment of eminent persons. This would mean that the Chief Justice would always need to be in the majority, and a 2-1 decision, with a dissenting note from the Chief Justice, would not result in an appointment. Neither the constitutional amendment nor the statute giving effect to the amendment make it clear how the six-member NJAC is expected to take its decisions. The ideal scenario, presumably, is for decisions to be made by consensus. But where consensus is not possible, the alternative is likely to be a majority decision procedure. The statute specifies that no person shall be recommended for appointment to the Supreme Court if any two members disagree with the appointment. The argument against this requirement is that both sides – the judges and the non-judges – have a veto power over appointments. Arguably, the Law Minister together with one or more of the eminent persons could exercise their veto against independent-minded candidates. In order to grant the judges a degree of primacy in the process, the Supreme Court could read down this provision as applying only to the judges. This would, in other words, mean that assuming that all six members of the NJAC participate and vote, a successful appointment would require the concurrence of at least two of the three judges on the Commission. There are many reasons for which the middle road – constitutional rights-compliant interpretation – seems intuitively appealing. It would probably enable all sides to claim victory. The government could claim that its amendment secured the Court’s stamp of approval, the petitioners could claim that they succeeded in having important safeguards infused into the appointments process, and the Court could send the message that it has effectively protected constitutional rights without thwarting the democratic will. A legislative sequel or pushback from Parliament would be much less likely in the event of an interpretive solution than if the constitutional amendment were struck down. Nevertheless, the Court should be conscious of the risks associated with radically modifying the effect of the constitutional amendment. A fairly recent attempt at modifying the effect of a law (in which the provisions for appointment of Information Commissioners under the Right to Information Act 2005 were recast) came under severe criticism, following which the Supreme Court stepped back from its judgment in a review petition (for analysis, see here). Most importantly, some of the interpretive possibilities articulated here may produce an appointments process that closely resembles the existing collegium system. Thus, the NJAC could become the collegium in disguise – in which case, the Supreme Court would have successfully struck down the amendment without being transparent about doing so. It is submitted that the Supreme Court can address all the arguments against the 99th Amendment in a cogent manner without striking down the entire framework as unconstitutional and thereby avoid throwing the baby out with the bathwater. Let us examine how it can assuage the unease of those who question the constitutionality of the new dispensation. First, with respect to the first argument, the Court can read into Article 124A a specific set of guidelines in accordance with which the eminence of persons to be appointed to the NJAC can be judged. More specifically, by delineating a set of factors which would be indicative of the persons’ vast knowledge of the law, impeachable integrity, lack of political affiliations and sustained and enduring commitment to public service and justice, the Court can effectively put to rest the fear that the appointment process would be dictated by extraneous political considerations, ulterior motives or the whims and fancies of the 3-member committee. Similarly, with respect to the second argument, there are at least 2 conceivable solutions that the Court can adopt to bring the exercise of veto power in line with the values of the Constitution. First, it can set out the parameters in accordance with which the veto power can be exercised, such as the need for those exercising that power to put forth cogent evidence that can bring into question the integrity and competence of the potential appointee in support of their stance. Second, in order to preserve judicial primacy, the court can give the CJI, as the chairman of the NJAC, the power to overrule the veto in exceptional cases by putting forth cogent and compelling reasons for the same. Finally, it is submitted that if the working of the NJAC is altered in the ways mentioned above, the argument that it undermines the independence of the judiciary would not pass muster for two reasons. First, as the first two Judges’ Cases unequivocally indicate, the focus of the judiciary has always been on highlighting the centrality of the role of consultation in the appointment process. Not only would the new framework institutionalize that desire in a far more well-structured and cohesive manner than has ever been done before, but the inbuilt checks in the new regime would enhance, as opposed to undermining, the independence of the judiciary. Second, the alterations that I have suggested would help create a robust bulwark against the arbitrary use of power which is the only way in which the avowed objective of judicial independence can be achieved. In order to implement this solution, the judiciary would have to structure its scope and contours in such a way as to bring it in line with Article 124C of the Constitution. Article 124C reads as follows: “Parliament may, by law, regulate the procedure for the appointment of Chief Justice of India and other Judges of the Supreme Court and Chief Justices and other Judges of High Courts and empower the Commission to lay down by regulations the procedure for the discharge of its functions, the manner of selection of persons for appointment and such other matters as may be considered necessary by it.” As Article 124C expressly authorizes Parliament and Parliament alone to delegate to the NJAC the power to determine the procedures and parameters governing its functioning, the argument goes, the issuance of judicial guidelines on these issues would not only run counter to the express mandate of Article 124C, but would leave Parliament with no meaningful power to structure the working of the NJAC. I would submit that such an argument would not hold water for at least 2 reasons. First, while it is true that Article 124C authorizes Parliament to structure the working of the NJAC in exercise of which Parliament enacted the NJAC Act, the issuance of the guidelines that I propose would be nothing more than an interim measure aimed at filling the vacuum that Parliament has created by failing to put in place any objective parameters to govern either the appointment of eminent persons or the exercise of veto power. Put differently, these guidelines would be issued by the judiciary in furtherance of its bounden duty to construe any legislative action harmoniously with the Constitution and would not, in any way, deprive the Parliament of the power expressly granted to it under Article 124C. Ergo, Parliament would be free to incorporate, at any time of its choosing, the guidelines pertaining to the determination of eminent persons issued by the judiciary into Article 124A and the guidelines with respect to the exercise of veto power into the NJAC Act. It would also be free to modify those guidelines or put in place other safeguards in order to attain the fundamental objective of making the process of selection of eminent persons and the exercise of veto power less arbitrary and unfair. The power of the Supreme Court to issue guidelines in the existence of a legislative vacuum despite express constitutional provisions authorizing the Parliament alone to frame laws on the issues in question is best epitomized by its decision in the celebrated case of Vishaka v. State of Rajasthan where the Court issued a set of concrete guidelines for the protection of working women from sexual harassment at the workplace. Even though Article 51(c), Article 253 and entry 14 of the Union List in the 7th Schedule exclusively empower Parliament to frame laws to give effect to India’s commitments under international treaties, the Court decided to give effect to those commitments through the issuance of its guidelines to fill the void created by Parliament. Second, Article 141 and 144 impose a mandatory obligation on all authorities, civil or judicial, to follow the directions issued by the Supreme Court. Therefore, I would submit that the NJAC would be bound by the guidelines issued by the Supreme Court until Parliament makes express provisions to regulate the election of eminent persons or the exercise of veto power. If the 99th amendment or the NJAC Act had contained express provisions to address these two issues in a manner inconsistent with the Constitution and the judiciary had then issued guidelines to bring those provisions in line with the Constitution, the argument that such a step by the judiciary amounts to rewriting express statutory or Constitutional provisions may have passed muster, but since the two acts are completely silent about the parameters governing the exercise of veto power or the selection of eminent persons, the judiciary would be merely discharging its constitutional obligation in construing the new regime in a manner consistent with the Constitution. This would be a mere exercise of judicial pragmatism or, at most, a form of judicial activism actuated by the twin goals of preventing a constitutional crisis and ensuring that the process of judicial appointments does not suffer from the vice of arbitrariness. In sum, it is a widely accepted proposition that the collegium system entirely failed to achieve the objectives that it was set up for because of lack of transparency, absence of valid parameters for the appointment of members of the collegium as well as absence of objective criteria for the appointment of judges. This being the case, it would be in the fitness of things for the judiciary to imbue the consultative and transparent framework that the legislature, in its collective wisdom, has sought to institutionalize for the appointment of judges with the values that would bring it in line with the Indian Constitution. The criteria of ability and merit, which find mention in Sections 5(2), and Sections 6(1) and 6(3) belong to a genus and are indicative of qualities that are essential for performing the task of a judge. The NJAC is to draw guidance from these words and specify “any other criteria” of a nature akin to the criteria specified by Parliament. Upon application of the rule of ejusdem generis, the phrase “any other criteria” would take colour from “ability” and “merit”. This would act as a safeguard against the NJAC laying down arbitrary criteria for appointment of judges. By virtue of the application of the principle of ejusdem generis, it is argued that Section 5(2), Sections 6(1) and 6(3) and Sections 12(2)(a) and (c) of the NJAC Act do not suffer from the vice of excessive delegation. Section 12 of the NJAC Act is not an instance of the Parliament having abdicated its essential legislative function to the NJAC. Parliament has laid down its policy with sufficient clarity, on the basis of which the NJAC is expected to operate. Secondly, the approach adopted by the NJAC Act is in line with international best practice with regard to appointment of judges. Even the Constitutional Reform Act, 2005 (CRA 2005) of the United Kingdom, does not lay down any detailed suitability criteria for appointment of judges to the Supreme Court. Quite like the originally enacted Article 124, Section 25 of the CRA 2005 lays down eligibility criteria for appointment of a person as a judge of the Supreme Court (which includes criteria such as having held a judicial office for a period of at least 2 years, been a qualified practitioner for a period of at least 15 years, etc.). The selection process for appointments finds enunciation under Section 27 of the CRA 2005 which, in its sub-section (5), mandates that “Selection must be made on merit.” Evidently, CRA 2005 has only enumerated eligibility criteria for appointment of judges of the Supreme Court and it leaves wide discretion to the selection commission to assess the merit of a candidate by not enumerating the indicators of merit. In fact, the Supreme Court selection commission had by itself devised an “Information Pack” which enumerated the criteria for appointment of judges. In Part I of our defence of Article 124C, we had presented a similar position with regard to the original Article 124 which only laid down eligibility criteria for appointment of judges while leaving the assessment of suitability largely to the Memoranda of Procedure. Evidently, the Constitution of the Republic of South Africa, like the CRA 2005 does not lay down any specific criteria pertaining to assessment of the suitability of a candidate for appointment and the Judicial Service Commission is given wide discretion in formulating its procedure vis-a-vis the appointment and selection process adopted by them. The illustrative experiences of the UK and South Africa clearly indicate that wide discretion is given to their appointment commissions as regards the criteria for suitability for appointment of judges. Hence, the authority to determine the suitability criteria which has been given to the NJAC under Sections 5, 6 and 12 of the NJAC Act lies in sync with international best practices pertaining to judicial appointment commissions. In this regard, one of the provisions that the petitioners specifically challenged the validity of was Section 10(2) of the NJAC Act which lays down that the NJAC shall observe such rules of procedure, including the quorum at its meeting, as it may specify by regulations (under Section 12(2)(i)). The contentious issue was whether the NJAC can determine its own quorum by means of regulations. Quite unsurprisingly, the NJAC Act is not the only statute which comprises such a provision. Section 10(1) of the Insurance Regulatory and Development Authority, 1999, Section 8(1) of the Telecom Regulatory Authority of India Act, 1997 and Section 7(1) of the Securities and Exchange Board of India Act, 1992 are just some of the various statutes that envisage the body being constituted by these Acts as also the entity which lays down the quorum. Yet again, the NJAC Act does not create a legislative innovation in this regard. Thus, a provision such as Section 6(6), or the second proviso to Section 5(2), which lay down the voting requirements to be followed in the NJAC, are perfectly within the competence of the Parliament and cannot be challenged as an instance of excessive delegation. The policy with regard to the NJAC Act is abundantly clear. The Statement of Objects and Reasons of the NJAC Act explicitly contemplates “a broad based National Judicial Appointments Commission should be established for making recommendations for appointments of Judges of the Supreme Court and High Courts. The said Commission would provide a meaningful role for the judiciary, the executive and eminent persons to present their view points and make the participants accountable, while also introducing transparency in the selection process.” With the policy in place, the NJAC by means of regulations would only fill in relevant details with regard to the procedure to be followed by it. By no stretch of imagination can such regulation-making be challenged for being an excessive delegation of power. Hence, a challenge to Article 124C insofar it delegates the regulation making on the NJAC is misplaced. Among the many contentious issues that engaged the attention of the Supreme Court in the NJAC case was Article 124C which has been alleged to be violative of the basic feature of the independence of the judiciary. It has also been attacked for entrusting the Parliament with a function that, till now, formed part of the Constitution. On close scrutiny, it becomes evident that Article 124C empowers the Parliament in two respects: it commences with vesting Parliament with the legislative competence to regulate the procedure for appointment of Supreme Court and High Court judges. Thereafter, it provides the legal basis for the Parliament to empower the NJAC to lay down by regulations the procedure for discharge of its functions, manner of selection of persons and other matters considered necessary. 2. Similarly, Parliament has enacted the Supreme Court Judges (Salaries and Conditions of Service) Act, 1958 and the High Court Judges (Salaries and Conditions of Service) Act, 1954. The powers to enact both these laws can be respectively traced to Articles 125 and 221 of the Constitution. These provisions allow the Parliament to enact laws determining the salaries, pension and other privileges of Judges of Supreme Court (Article 125), and of the High Court (Article 221). 3. Under Article 138, Parliament may by law confer on the Supreme Court such further jurisdiction and powers with respect to any of the matters in the Union List. Consequently, Parliament has widened the jurisdiction of the Supreme Court by means of the Supreme Court (Enlargement of Criminal Appellate Jurisdiction) Act, 1970. Similar provisions pertaining to other aspects of judicial functioning exist throughout Chapter IV of Part V (the Union Judiciary) and Chapter V of Part VI (the High Courts in the States) of the Constitution. Essentially, Article 124C empowers the Parliament to enact a law regulating the procedure for appointment of judges of the Supreme Court and High Court, something which is entirely within its legislative competence. It would be anybody’s case that the method to remove judges as well fixation of their salaries and conditions of service are aspects vital to the independence of the judiciary. These laws cited above are just as vulnerable to amendment by the Parliament as provisions of the NJAC Act would be. The framers of the Constitution could not have intended to compromise with the independence of the judiciary by vesting Parliament with the power to enact such laws. In fact, such provisions are reinforcement of the wisdom of the Parliament to enact laws which are not prejudicial to judicial independence. Clearly, regulation of certain facets of judicial functioning by means of Parliamentary law is not an innovation devised by Article 124C. Articles 124(3) and 217(2) must be viewed against the backdrop of the distinction between “eligibility” and “suitability”, as enunciated upon in Mahesh Chandra Gupta. When Article 124(3) mandates that a person shall not be qualified for appointment as a Judge of the Supreme Court unless he is a citizen of India and (a) has been for at least five years a Judge of a High Court or of two or more High Courts in succession; or (b) has been for at least ten years an advocate of a High Court or of two or more High Courts in succession; or (c) is a distinguished jurist, in the opinion of the President, it only lays down the minimum eligibility criteria that need to be fulfilled for a person to be considered for appointment. Similarly, Article 217(2) lays down minimum eligibility criteria for appointment of a person as a judge of a High Court. Clearly, the framers of the Constitution found sufficient to only enumerate the “eligibility criteria” within the four corners of the Constitution. “Suitability criteria” would have to be located somewhere else. Hence, seniority is used as one of the criteria to determine suitability of a candidate under the Memoranda. The Memoranda, for both the Supreme Court and the High Courts lay down the procedure to be followed for appointment of the Chief Justice, Acting Chief Justice, permanent judges, additional judges, ad hoc judges and acting judges, as and when applicable. The Memorandum of Procedure for the High Courts also specifically lays down the procedure for transfer of a Judge from one High Court to another High Court. Keeping in view the framework of Articles 124 and 217, and the Memoranda of Procedure, it can be inferred that the framers of the Constitution did not find it imperative to include suitability criteria within the provisions of the Constitution. In fact, thus far, the task of laying down suitability criteria is being performed by the executive by means of these memoranda of procedure. It is difficult to imagine how the independence of the judiciary would be violated if this task is now entrusted to the Parliament under Article 124C. In light of the above, it is submitted that Article 124C is not violative of the independence of the judiciary. In fact, it is an attempt to put flesh and blood into the skeletal structure that the 99th Amendment seeks to create. In the second part of this essay, we would proceed to argue that Article 124C is not an instance of excessive delegation, and falls within the permissible limits of delegated legislation. (In the previous essay, I had argued that Article 124C should be struck down, because it violates the separation of powers and the independence of the judiciary, both of which are part of the basic structure. In this essay, Vishwajith Sadananda and Malavika Prasad respond to that claim, arguing that 124C is entirely constitutional). The charge against Art. 124C is that the Parliament has abdicated its constituent powers, by delegating those powers to the legislature, i.e. the Parliament in its legislative capacity, and that such excessive delegation violates the principle of separation of powers. To contest this proposition, we argue that first, the nature of amending power itself requires it to be sovereign, and thus superior to the legislative, executive and judicial powers, and second, that separation of powers cannot possibly apply in the context of a power that is subordinate to another. While Ray C.J. may have been on the minority on the specific point that constituent power is sovereign, in that it is “independent of the doctrine of separation of powers” (paragraph 48, Indira Nehru Gandhi vs Raj Narain), the proposition is not alien to our understanding of constituent amending power today. After Keshavananda and Indira Gandhi, the constituent amending power is only subject to the basic structure doctrine. In other words, an exercise of constituent amending power is not plenary or “sovereign”, akin to the constituent power to constitute a sovereign. This is because, while wielding constituent power to frame the constitution, the framers are bound by no constitutional constraints; they wield a sovereignty by which they validate the constitution (call this ‘original sovereignty’). This sovereignty is external in a manner of speaking, having been arrogated by the constituent body to itself, rather than conferred by a superior or sovereign authority or instrument. Necessarily then, it cannot be subject to any fetters, there being no fettering authority or instrument. This sovereign has plenary powers to author new political systems, forms of governance and a constitutive instrument. Once constituted however, the political essence of the Constitution so created forms the basic structure of the Constitution. The basic structure can thus only be altered by an institution vested with ‘original sovereignty’, since it would amount to authoring a new political form. Since the constituent amending power finds its origin in Constitution of India, and since a power originating from an instrument cannot possibly be larger than the instrument creating it, even at its widest exercise, amending power under Art. 368 is inherently limited in extent, compared with the constituent power to frame a constitution. These constraints are neither externally imposed nor implied into constituent power. These constraints are the basic structure, as we understand it today. The legislative, executive and judicial powers, akin to the constituent amending power, are powers that were created by an exercise of sovereign, plenary constituent power. To that extent, the legislative, executive and judicial powers can also be exercised only subject to the Constitution. However, it would be incorrect to suggest a likeness on all fronts, between these three powers and the constituent amending power. Constituent amending power is still the superior power in that an exercise of amending power under Article 368 can widen or constrict the extent or fields of judicial, executive or legislative power vesting in the wings of the State, so long as the basic structure is not destroyed. Consider, for instance, the amendments that have introduced whole new entries into List I of the Seventh Schedule (Entry 2A, and amended Entry 63 etc. ), thereby significantly expanding the fields in which the Parliament is competent to legislate. It is this recognition of the superiority of the constituent amending power that underlies the impermissibility of conflating Parliament’s power under Art. 368 with its power under Art. 245. It is also this superiority of the constituent amending power that impelled the Court in Indira Gandhi to prevent the amending power from being used to carry out judicial acts (as Art. 329A(4) sought to), such as voiding judgments and orders of Courts. The reasoning was not rooted in impermissibly upsetting the separation of powers vertically, between the constituent amending power and judicial power, by way of “delegation”. It was based in the impermissibility of divesting the High Court of its judicial powers, and then, worse still, not conferring that jurisdiction upon any other Court. (Para 201, Khanna’s judgment in Indira Gandhi), thus taking away the right to a free and fair election, and the remedy to challenge it (para 206). The right to a free and fair election was central to the democratic form of government, that is a part of our basic structure. The logic of Hinds vs The Queen and Madras Bar Association vs Union of India, that converting judicial power to executive power upsets the separation of powers, would apply with equal force to conversion of constituent power to legislative power only if there existed a separation of powers vertically. There cannot possibly be a separation of powers (whether rigid or flexible) vertically, between constituent amending power and the three powers subordinate to it, as such separation is antithetical to the very power to amend. The power of amendment is only subject to the basic structure doctrine. Outside of the constraints posed by the basic structure, the power of amendment is plenary. 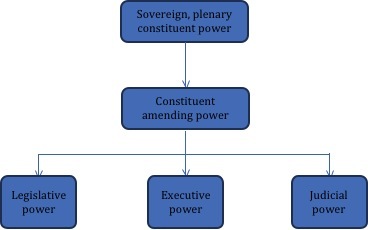 Until we evolve a norm that constitutionalises the separation of powers vertically, between the amending power and other powers, and that too, to the extent that it becomes part of the basic structure of the Constitution, the prevalent understanding of the principle, as between the three equally situated powers cannot be sought to be pressed in force here. Art. 124C must be viewed in the context of the provisions that empower the Parliament to enact laws generally: Articles 245 (which begins with the words “Subject to the provisions of this Constitution…”) and Article 246. The source of the power of the Parliament is thus the Constitution itself, and the amendment is not, and cannot, confer any new or additional powers. In exercise of the powers vested in it, the Parliament can enact laws in the fields enumerated in the Seventh Schedule; in this specific case, the Parliament is allowed the breadth of Entry 77 of List I. Thus, exercise of power under Art. 124C cannot possibly result in damage to the basic structure that is irremediable, being effected by way of a legislation, given that both the power to legislate as well as the fields of legislation were in the Constitution to begin with. Any argument that Article 124C could enable the Parliament to effectively undo the independence of judiciary is necessarily premised on the assumption that Articles 245-246 read with Entry 77 of List I are incapable, in and of themselves, to ensure the independence of the judiciary. Such a proposition obviously cannot be countenanced, as provisions of the Constitution cannot possibly be unconstitutional, for being destructive of the basic structure. It is an interesting and noteworthy aside, that under the collegium system, the manner of appointments was in fact determined by two executive memorandums- the “Memorandum Showing the Procedure for Appointment of the Chief Justice of India and Judges of the Supreme Court” and the “Memorandum Showing the Procedure for Appointment and Transfer of the Chief Justices of India and Judges of the High Court”, which are extra-constitutional instruments. As for the claim that Article 124C violates the independence of the judiciary, the true nature of judicial independence under the Indian Constitution cannot be lost sight of. In India, in the context of separation of powers, we follow a system of checks and balances, with each wing ensuring that power does not get concentrated in the hands of the other wings. “: …We have invested the Judiciary with as much independence as is possessed by the Privy Council in England and to large extent, by the Supreme Court of America; but any water-tight compartments of powers have been rejected. That is with regard to separation of powers. Subsequently, the amendment was negatived. Under our constitutional scheme, the judiciary has never traditionally been completely free from Parliamentary supervision. For example, the salaries of judges are governed by a law passed by the Parliament under Article 125. The impeachment of judges of the Supreme Court, under Article 124(5), is also governed by a law passed by the Parliament. It goes without saying that both these aspects have always been considered to have a central role in ensuring the independence of the judiciary, world over. As one of us has argued before on this blog, the amendment will have to be tested on the basis of the degree or extent to which the independence of the judiciary is disturbed. From our analysis above, it becomes evident that Article 124C does not eviscerate the independence of the judiciary but only subjects it to Parliamentary supervision, in tune with our constitutional tradition. Over the last one week, we have debated the constitutionality of Article 124A of the 99th Amendment, which constitutes the National Judicial Appointments Commission. Let us now consider an equally important provision that the 99th Amendment seeks to insert into the Constitution – Article 124C. Article 124C authorises the Parliament to “regulate the procedure for the appointment of Chief Justice of India and other Judges of the Supreme Court and Chief Justices and other Judges of High Courts and empower the Commission to lay down by regulations the procedure for the discharge of its functions, the manner of selection of persons for appointment and such other matters as may be considered necessary by it.” This is in contrast to the old, un-amended Article 124, which laid out the entire procedure of judicial appointments within the Constitution itself (as interpreted by the Supreme Court in the Second Judges’ Case, 1993 (4) SCC 441). Consequently, under the old regime, the appointment process was part of the constitutional scheme (i.e., contained within the Constitution), and any change in the process of appointments could only be made through a constitutional amendment. The 99th Amendment – which introduces Articles 124A, B and C – is itself evidence of this fact. By contrast, under the new regime, a significant part of the appointments process will be shaped and structured by the Parliament through “regulations” – i.e., through the process of ordinary law-making. It is well-accepted that Parliament acts in different capacities while amending the Constitution, and while passing ordinary legislation. The former is an exercise of constituent power, while the latter is an exercise of legislative power (Indira Nehru Gandhi vs Raj Narain, 1975 SuppSCC 1). Being a Constitutional amendment, Article 124C is therefore an exercise of Parliament’s constituent power, which delegates the (a significant part of the) procedure for appointment of judges to Parliament exercising its legislative power. Furthermore, Article 124C also authorises Parliament, while acting in exercise of its legislative power, to delegate in turn to an executive authority (the NJAC), the ultimate process of judicial selection. In this essay, I will argue that this form of delegation violates the basic structure of the Constitution by removing the core of the appointments process from the Constitutional scheme, and placing it within reach of ordinary legislation as well as executive action. Let’s start with a hypothetical. Consider Articles 54 and 55 of the Constitution. Article 54 stipulates that the President shall be elected by an electoral college. Article 55 lays down detailed guidelines for the election, aimed at achieving parity of representation. Suppose that through a constitutional amendment, Parliament was to erase Articles 54 and 55, replace them with a new “Article 54A”, which stated: “Parliament shall regulate the procedure for the appointment of the President of India and such other matters as may be considered necessary by it”. I suspect many of us would find this amendment deeply problematic. To understand why, we need to take a detour through the principle of excessive legislative delegation, and then draw an analogy with Article 124C. “… the Indian Legislature… could not create another body with the same powers as it has or in other words, efface itself.” (paragraph 17). What is the relevance of this? I would contend that just as the legislature is not permitted to transfer or abdicate essential legislative functions to the executive, the parliament, in exercising its constituent power, is not permitted to transfer or abdicate its constituent functions to the legislature. This is because such an act would violate two of the basic features of the Constitution – separation of powers and the rule of law – and more specifically, Section 124C also violates the basic feature of judicial independence. Each of these issues will be discussed in the context of Section 124C. It has been repeatedly held by the Supreme Court that the separation of powers is a basic feature of the Constitution. (Kesavananda Bharati vs State of Kerala, AIR 1972 SC 1461; Indira Nehru Gandhi vs Raj Narain) The precise character of the separation of powers in India – which commentators have often classified as a “flexible” separation instead of a “rigid” one – flows from the Constitution. In other words, the structure and allocation of powers between the three wings of State are determined by the Constitutional scheme. Consequently, it is not open to Parliament to transfer powers from one of the wings of State to another, even through a Constitutional amendment (because this would upset the Constitutional scheme of separation of powers). In addition to Justice Khanna, Justice Beg also held the 39th Amendment to be void for violating the basic feature of the separation of powers, since it sought to concentrate judicial power in the hands of the Parliament (paragraph 690). Two judges out of five, therefore, specifically invalidated a constitutional amendment because it sought to change the separation of powers scheme that flowed from the Constitution. It is submitted that the logic of Hinds vs The Queen and Madras Bar Association vs Union of India – namely, that converting judicial power to executive power upsets the separation of powers that flows from the Constitution – applies with equal force to parliament converting constituent power to legislative power. By doing this, Parliament grants to itself (functioning as a legislature) the power to change through ordinary law-making what earlier could be changed only through constituent lawmaking. This, naturally, aggrandises the power of the Parliament at the expense of the other branches. The only difference with the more familiar cases in Hinds and Madras Bar Association is that instead of taking power from one of the other co-ordinate branches, the Parliament is taking it away directly from the Constitution. The violation of the basic structure is therefore clear. In sum: A matter that was regulated by the Constitution (appointment of judges) under the unamended Article 124 cannot, via amendment, be delegated to merely legislative control, as this violates the principle of separation of powers. Article 124C is not only destructive of the separation of powers more generally, but is also specifically destructive of judicial independence, which has been held to be part of the basic structure (Second Judges Case), and has been admitted to be so by the Respondents in this case. Judicial appointments have also been held to be an essential aspect of judicial independence (Sub-Committee on Judicial Accountability vs Union of India, (1991) 4 SCC 699; Union of India vs Pratibha Bonnerjea, (1995) 6 SCC 765). It is for this reason that the erstwhile Article 124 regulated the system of judicial appointments as part of the constitutional scheme. However, under the new Articles 124A-B-C regime, the only aspect that is part of the Constitutional scheme is the make-up of the NJAC, in Article 124A. As is evident from the NJAC Act, Article 124C allows the Parliament to make rules with respect to critical issues such as quorum, vote weightage, veto powers, tie-breaks, and even selection criteria for the “two eminent persons”, who constitute one-third of the strength of the NJAC. It is obvious that each of these issues can have a significant impact upon the outcome of the selections process, and taken together, they can change its entire character. For the reasons adduced above, this amounts to a significant delegation of constituent power, and is therefore impermissible. It might be argued that the delegation in this case is within permissible parametres. Reliance might be placed upon the cases cited above to argue that the policy has been laid out in Article 124A and B, and the goal of C is to simply provide for day-to-day implementation. A quick glance at 124A, B and C reveals, however, that both the functionality test, and the control test, have been violated. As discussed above, the nub of the control test is there should be ongoing supervision, a “living continuity” of control. This is impossible under the 124A-B-C regime, because the Parliament only acts in its constituent capacity when it is amending the Constitution. The difficulties of putting together super-majorities to amend the Constitution means that this is an infrequent occurrence. Consequently, once 124C has delegated the major questions of appointment to legislative control, without any guidance under 124A or B, it is obvious that supervisory control is impossible. This position is exacerbated by the fact that after I.R. Coelho vs Union of India ((2007) 2 SCC 1), it is arguable that ordinary legislation is not subject to the basic structure. This leads to a perverse situation, where the only possible form of control – that of approaching the Courts – will be unavailable if Parliament, in pursuance of its authority under Article 124C, frames perverse rules or regulations dealing with the constitution and procedures of the NJAC, which completely undermine the independence of the judiciary, but which Parliament is not barred from doing under 124A-B-C as they stand. As pointed out above, the 124A-B-C scheme, as it stands, leaves huge swathes of discretion, in critical areas, to the Parliament (which, in turn, is further allowed to leave them to the Commission itself). With respect to the workings of the NJAC, these include issues of quorum, voting weightage, tie-breakers, and selection criteria, to name just four. There is no “guidance” provided by the wording of Article 124A, which solely deals with the composition of the NJAC, or 124B, which solely deals with appointment of judges on the basis of ability and integrity. This, therefore, amounts to an impermissibly excessive delegation of an essential constitutional function to the legislature (arguing merely legislative power). It is evidence that none of these six crucial issues are present in the 99th Amendment. In fact, as the NJAC Act shows, all these have been left to the Parliament, through the process of ordinary law-making. This, therefore, is not a case of the parent law laying out the vision and encoding it as a legal rule, with only the “gaps” needing to be filled in by the delegate. On the other hand, this is an impermissible substitution of power – from the Constitution (via constituent law-making) to the Parliament (through legislative power). Article 124C violates the basic structure of the Constitution, and ought to be struck down. By using its constituent power of amendment to draft a provision that delegates what was earlier part of the constitutional scheme to the ordinary legislature, Parliament, in framing Article 124C, has violated the basic feature of the separation of powers. Specifically, it has also violated judicial independence by placing far-reaching powers with regard to the manner and functioning of the NJAC in the hands of the legislature. Drawing an analogy with the rule against non-delegation of essential legislative functions, it can be seen that 124C does not have the safeguard of continuing supervision of the legislature. Furthermore, since Article 124A only provides for the make-up of the NJAC, the Article 124C’s delegation is not merely allowing the legislature to fill in gaps in order to give effect to the constitutional scheme, but effectively amounts to a substitution of constituent power. For all the reasons adduced above, this violates the basic structure. It is also clear that if Article 124C is struck down, then nothing remains of the 99th Amendment, and the rest of it must go as well. Without Article 124C, all that remains is the Judicial Appointments Commission, without any further details about its functioning. Consequently, Article 124C is not severable from the rest of the 99th Amendment – if the Court decides to invalidate it, it must also strike down the entire Amendment, including Article 124A.